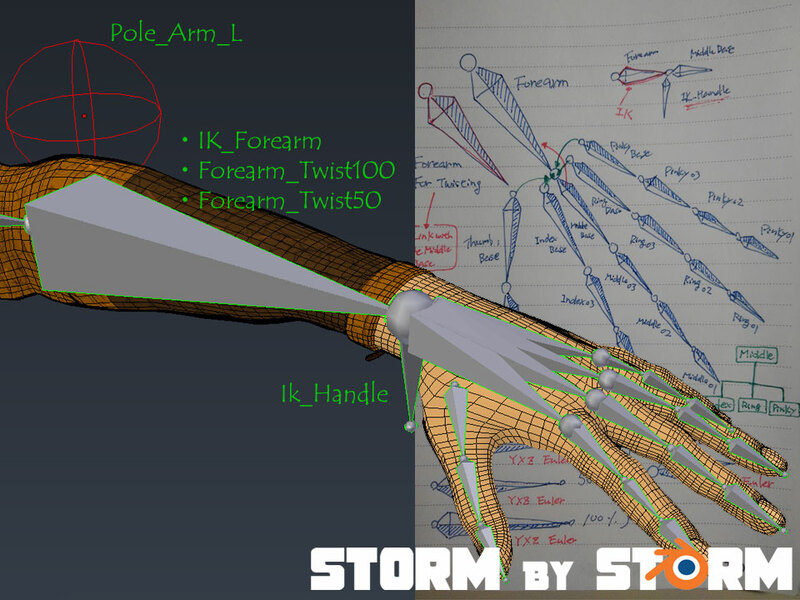 "Inverse Kinematicks" was installed on the forearm part. "Forward Kinematics" (FK) is the normal way of manipulating a bone chain, based on parent-child relationships. You need to rotate each bone individually. Inverse Kinematics (IK) is another way, where the movement of the chain is determined by a "target" bone (and optionally a "pole target" bone) instead of the normal parent-child relationships. Basically you position the end of the chain, and the IK solver calculates what the rest of the bones need to do in order to make that happen. In addition, "hand" has many joints in such a narrow area. That is exactly "complex" itself. In other words, in order to improve the efficiency of animation, I need to rationally use "constraint" and "expression".